"From the Great Saltworks of Salins-les-Bains to the Royal Saltworks of Arc-et-Senans, the production of open-pan salt" represent the extraction and production of salt from the middle ages to the 20th century. Salins-les-Bains and Arc-et-Senans were connected by a brine pipeline. 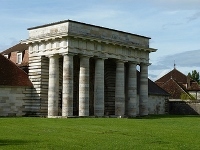 Arc-et-Senans is also notable as an early Enlightenment architectural project to rationalize industrial buildings and processes according to a philosophical order. The saltworks' buildings were designed by architect Claude-Nicolas Ledoux. Construction began in 1775 during the reign of Louis XVI. The semicircular complex was planned to reflect a hierarchical organization of work. It was to have been enlarged with the building of an ideal city, but that project was never constructed. From the Great Saltworks of Salins-les-Bains to the Royal Saltworks of Arc-et-Senans, the production of open-pan salt is one of the more imaginative WHS of France. With an admission date of 1982 it also is one of the earlier sites on the WH List. So I was really looking forward to visiting, and it did not disappoint. I even had wanted to stay overnight at Arc-et-Senans, but when I checked 2 months beforehand the on-site hotel La Saline Royale was already fully booked for the date that I wanted. My planned visit on a Sunday in March left me with a dilemma: because of the limited opening hours during the winter season, I only had time to visit 1 out of the 2 inscribed locations (Arc-et-Senans or Salins-les-Bains) properly. I eventually chose Salins-les-Bains, as its features are mostly underground and less weather dependent. The site lies in the French Jura, quite a trip through the countryside away from the nearest tollway exit. During the weekends off-season there are 3 daily tours of the underground saltworks. They are all conducted in French, although foreign speakers are provided with a leaflet in English. The stories of the guide are much more detailed though than what’s available on paper: you can download an audioguide in your language beforehand for your phone, but I forgot to do that. So I did my best to understand the French explanations. The 1 hour tour teaches you everything that you never knew about salt. The product was so valuable in its heydays that the big Salins-les-Bains complex only had one small exit, where the labourers were checked everyday so they did not smuggle salt to the outside world with them. The factory at Salins-les-Bains was purposely built near a forested area to provide for its high energy approach to sustain the artificial evaporation process. The main distinguishing feature of Salins has been described by ICOMOS as “extraction techniques, notably the existing underground facilities, which testify to the pumping system and the production of open-pan salt”. There’s always some excitement about an underground tour, though I must say that there aren't many original features left. The saltworks here were based on preserved layers of salt beneath the ground. Via an extraction process (partly done by horses and later using water wheels), brine would be pumped into pans and concentrated by the heat of the fire burning underneath. As crystals of salt formed these would be raked out and more brine added. The huge drying racks and fans can still be seen. I left Salins-les-Bains just after noon, and decided to make a short detour to Arc-et-Senans. Both of the Saltworks were linked together by a double-pipe system. This main location is situated some 20 minutes northwards and is only open from 10-12 and 14-17. But I hoped to still get a glimpse of this highlight of classicist architecture. Well, it wasn’t really worth it: the Royal Saltworks of Arc-et-Senans are fully surrounded by a 3m high wall! The gate was locked and I could only admire the main entrance. This is a very interesting site consisting of 2 separate components located near the Swiss border. I set out to visit both places by public transport from Besancon in one day. The train ride from Besancon to Arc-et-Senans is straightforward and very short, and the salt works are just a few steps from the station. As stated in the other reviews, Arc-et-Senans is mostly about architecture and urban planning, and the creation of a model city that was never fully realized. It is very pleasant to walk from building to building, which are set up in a semi-circle, and also to explore the surrounding gardens. The buildings have different purposes, from hotel rooms to exposition space (including a nice exhibit on World Heritage sites), and it takes a few hours to see everything. I then took the train to Mouchard and waited for a bus to Salins-les-Bains that didn't come (apparently I had misread the schedule, because there are fewer buses in summer, during school holidays). The lady at the SNCF ticket counter was nice enough to call me a taxi so that I could arrive at Salins-les-Bains (about a 15-minute drive away) in time for the German guided tour (they started with these this year, and tours are also available in English, at least in summer). They take you underground and give interesting explanations about salt extraction and the lives of the miners; some parts date from the 12th and 13th centuries. Afterwards, you also see a building aboveground that contains original artifacts such as salt pans. In the late afternoon, I took a bus from Salins-les-Bains (which is by the way a very pretty town with a nice historic centre) to Mouchard, from where I caught a train to Besancon. Taken together, both sites provide an interesting overview of the trouble taken to provide people with salt, which is of course not only needed for health reasons, but in the past was also used to cure meat and as a form of payment (where the word "salary" comes from). I visited this industrial heritage in July 2013. Like Paul, I had no idea what to expect or what I was going to see. Well, my visit to Arc-et-Senans and especially to Salains-les-Bains proved to be remarkable to say the least. This became my favourite industrial WHS! The Royal Saltworks of Arc-et-Senans were interesting mostly for their architecture and utopian planning. I learnt that it is also possible to sleep inside the Royal Saltworks as there are a couple of rooms available for 85euros. This means you'll have the Royal Saltworks almost for yourself in the morning before opening hours. However, the highlight of my visit was the Salt Mine and Museum in Salains-des-Bains. You have to visit with a French-speaking guide but an information sheet in English is provided with a translation of the guide's commentary. The guide was really excellent and really gave an interesting tour. The salt mine machinery is still fully functional. Do try the sweets they sell in Salins-les-Bains with the local salt. Yummy! 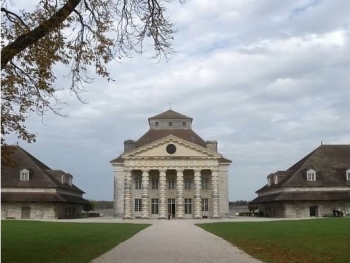 The site of Arc et Senans is actually composed of two elements; The first one is the Saline Royale (Royal Saltworks) situated in Arc et Senans. It has been built during the 18th century by the famous French architect Claude-Nicolas Ledoux and is a great testimony of an Enlightenment project on one hand, and of an industrialized planned city, designed for a specific task, salt treatment, on the other hand. The city has been planned as a 'Perfect city' with all the building necessary for its people from school to church passing by hospital and accommodations. 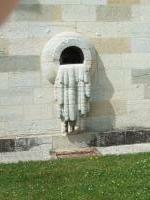 The second element is the great saltwork situated in Salins les Bains, 20km from Arc et Senans. In this city you will be able to experience the guided visit of the museum that begins under the ground, with the salt mine and finish outside, in the furnace room where salt blocks were treated. I reached Arc-et-Senans by train from Besancon and returned to Dole. Salines Les Bains can be accessed by bus from Mouchard station. There is an interesting collection of models of buildings, built and unbuilt, by Ledoux in the tonnellerie. I liked this site because of the quality and originality of its architecture. It's one of the most interesting industrial sites and it's worth to be visited if you are in the region of France County. It justifes the inscription also because there aren't many other industrial sites on the WHL, even if could be inscribed together with the nearby saltworks of Salins-les-Bains (currently on the Tentative List). 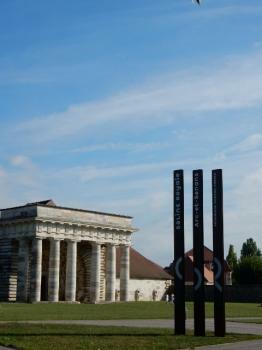 When we visited the Royal Saltworks of Arc-et-Senans we were not really aware of what we were going to see. We were somewhat surprised to discover a site much broader in concept than the title might imply. It comprises a planned town of the late 18th century which was developed around a factory to produce salt from nearby saline deposits in the Jura using wood from local forests as the fuel. As a product of the Enlightenment it is set out on “rational” grounds in a semi circle (although in its original concept it was to be a full circle). Some of the buildings (photo) follow classical designs. A lot of reconstruction has taken place – it was badly damaged by fire in 1918 and a dynamite explosion in 1926. A number of the buildings (each had a very specific purpose in the overall design and that of the “Overseer” is a fine structure) are open and contain exhibitions showing the history and production processes. The site presents an interesting example of 2 different WHS themes, Town Planning and Industrial Architecture, whose development can be traced across other eras and countries elsewhere in the list (eg New Lanark and Brasilia!). It is for that reason, in my opinion that Arc-et-Senans, justifies its inscription. Michelin may only give it 1* and it is true that the buildings and exhibits taken individually are nothing special but, taken as a whole, and as part of the wider concept, it is well worth visiting. From "Royal Saltworks of Arc-et-Senans", To: "From the Great Saltworks of Salins-les-Bains to the Royal Saltworks of Arc-et-Senans, the production of open-pan salt"